Getting a bathroom remodel can be an exciting way to improve its look. You can make changes ranging from new tiles to better lighting. Still, some homeowners neglect how their cabinets come into play. With these tips from a trusted remodeling contractor, you can turn them from a secondary aspect to a valuable asset. Before we look at the style, we have to remember why you need cabinets. Storage is their main purpose, especially with smaller homes. The last thing you want is to leave your towels and toiletries exposed. That’s why you should always remember to get the right cabinet size. As a general guide, bathroom remodeling contractors relate size to the contents. For example, large cabinets are best for towels, laundry hampers, ironing boards and other essentials. Meanwhile, smaller shelves are good for your hair dryer, lotion and toiletries. Once you know what you need, finding the best look is easy. Look carefully at the bathroom you plan on updating. It’s important that the style of your cabinets blend well with the rest of the room. If you’re unsure, it’s best to stick with the neutral colors like grey and white. They can never go wrong or ruin a room. For more complex designs, look at where your plumbing is. If you don’t mind them showing, build the cabinets around it. If you prefer them hidden, try making a vanity that covers the area or set up the furniture nearby. Ask your bathroom remodeling contractors on the best workaround. These are some of the key tips we have on hand to make your cabinets feel special and welcome. We offer other remodeling jobs and services, as well. 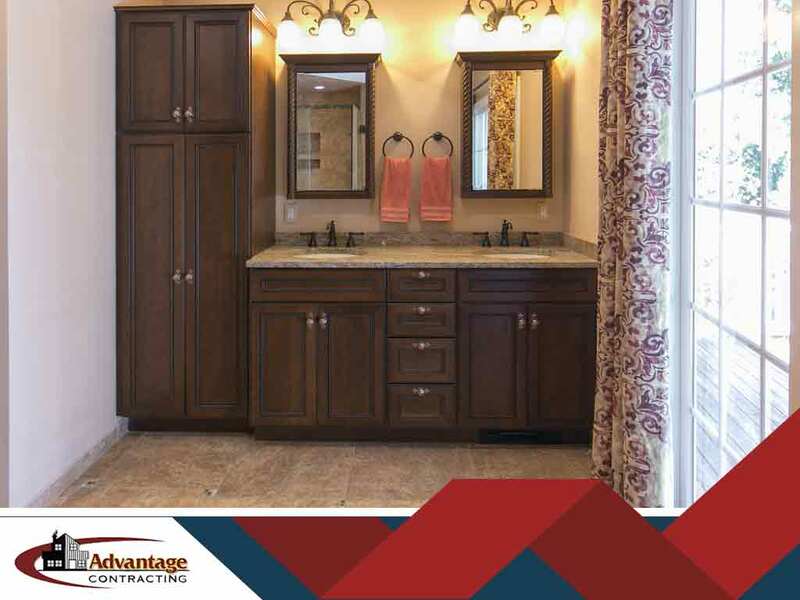 Advantage Contracting is the leading home remodeling company in Wayne, Kinnelon and Wycoff, NJ. You can call us at (862) 292-0003 or fill out this contact form to request a free quote.